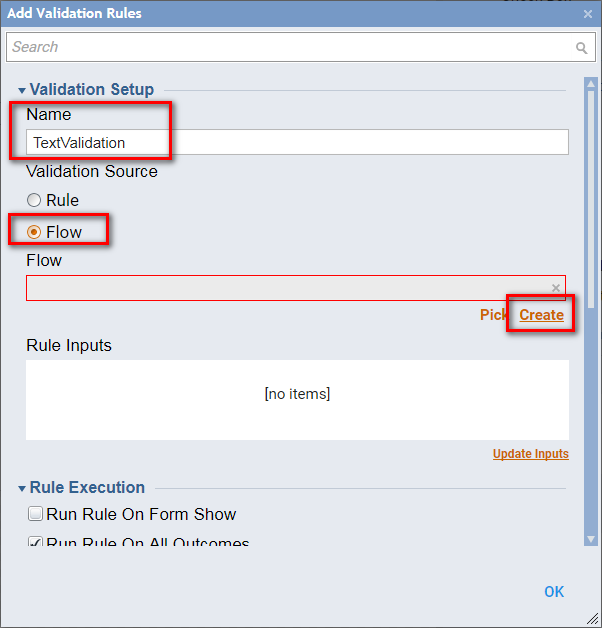 This tutorial demonstrates how to use Flow	as a Validation Rule	on the Form	. To learn about Validation Rules , please click here	. 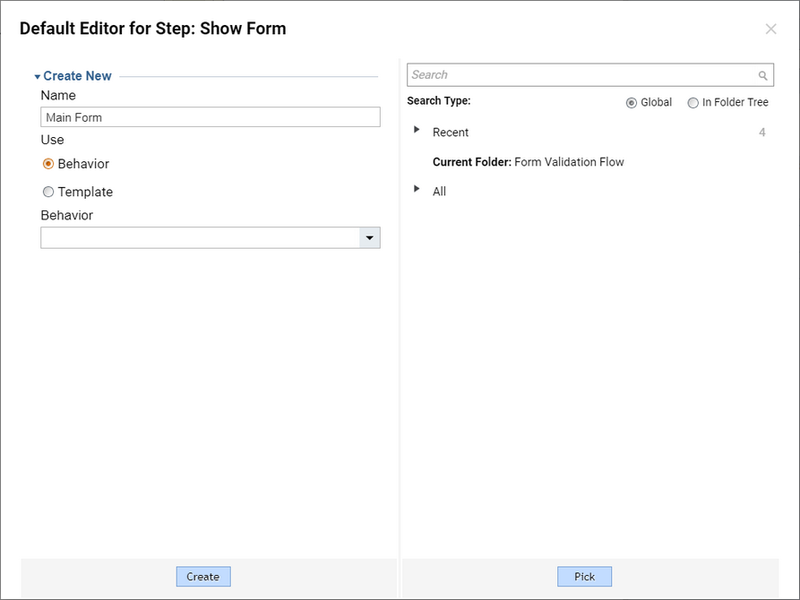 Flow Validation Rule	can be used for designing more advanced validations and applying them to different components on the Form . 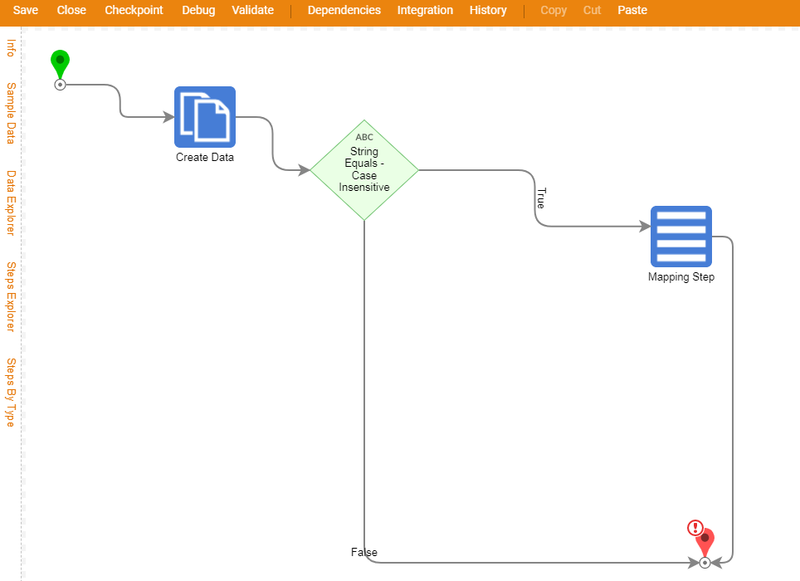 Validation Flow evaluates inputs and returns a collection of Form Issues that contain data about controls it should apply to, message it should display and breaking level of the issue. In this example we are going to create a simple Flow with a Form . Our Form is going to have a Text Box component. 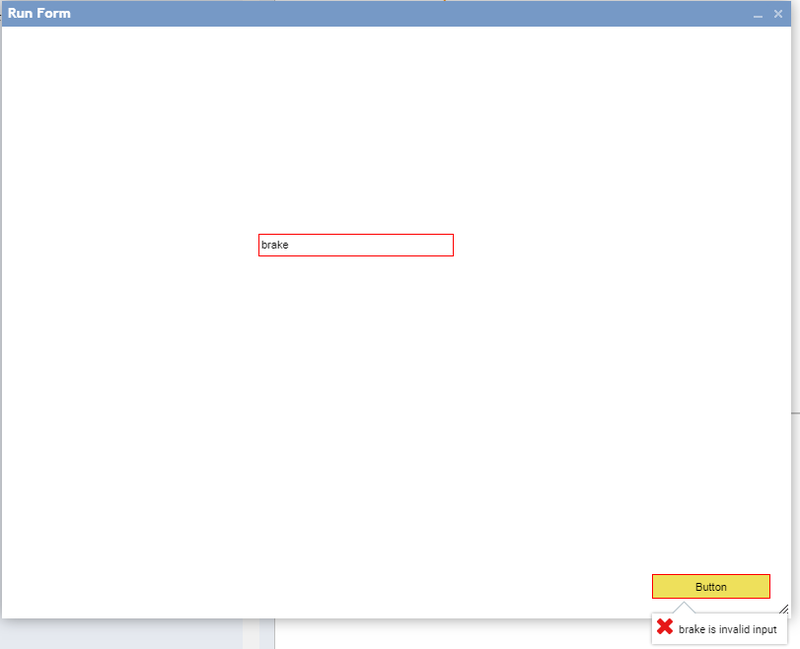 We are going to apply Flow Validation Rule	for this Text Box component. 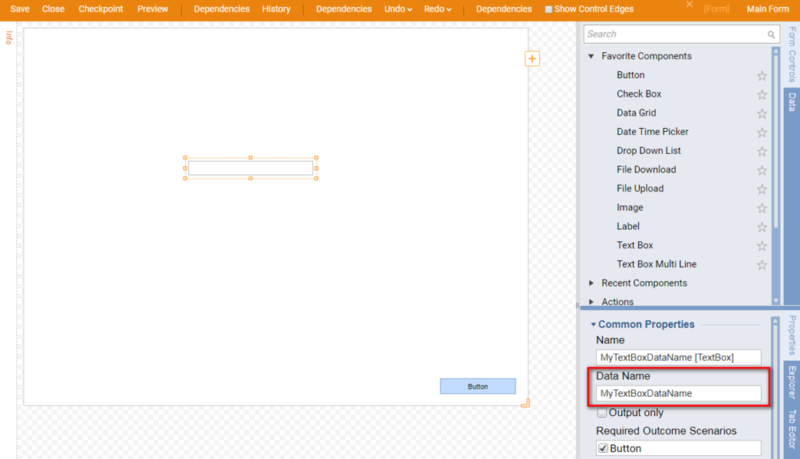 We begin in a Designer Folder	with clicking Create Flow	on the Folder Actions Panel. Then, we Name	the Flow and click Ok	to proceed to the Flow Designer . 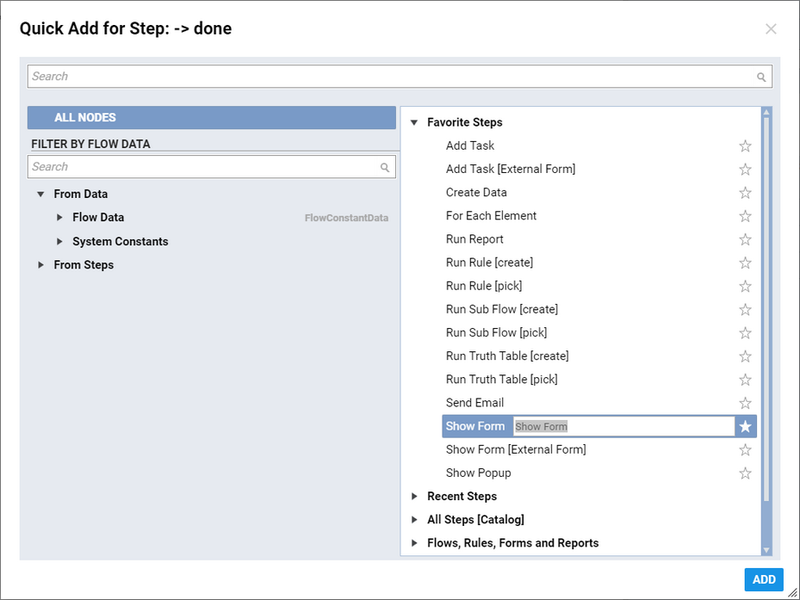 In the Flow Designer we add Show Form	component from Favorite Steps	category. 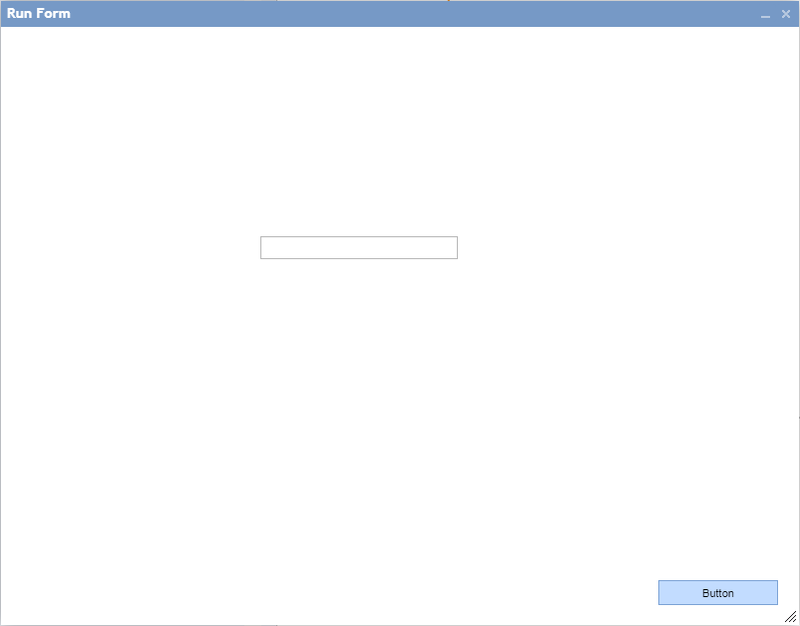 Next, we Name	the Form and click Create	to proceed to the Form Designer. 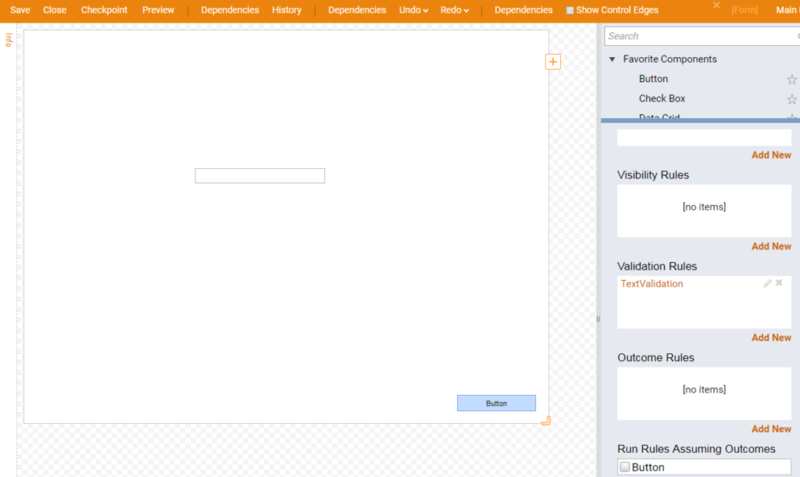 In the Form Designer we add Button	control and Text Box	control to our Form . Note: we need to remember Data Name for the Text Box control because we are going to use it later in this tutorial. 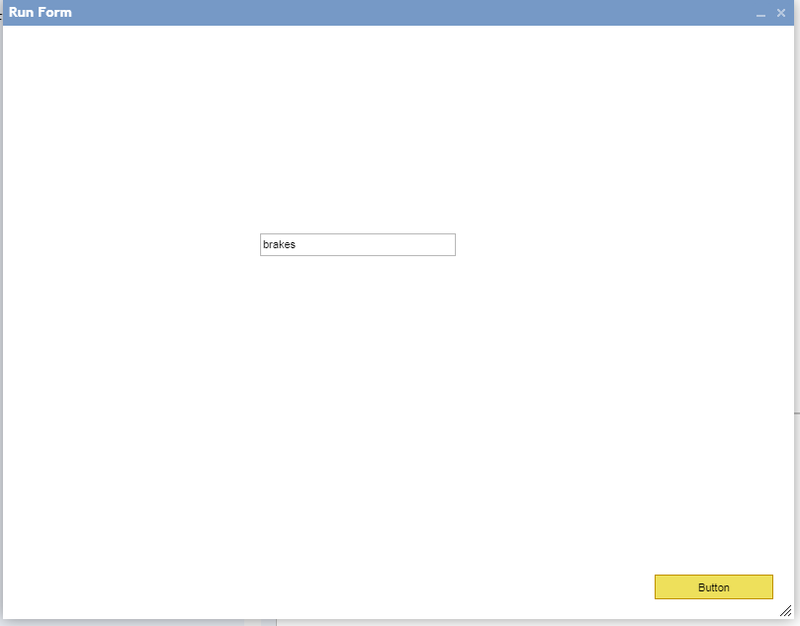 Then, we navigate to Form Settings by clicking outside of the work-space in the Form Designer . 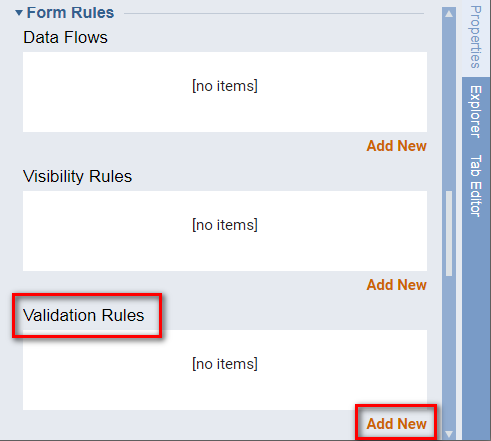 We locate Validation Rules	under Form Rules	section and clickAdd New	. 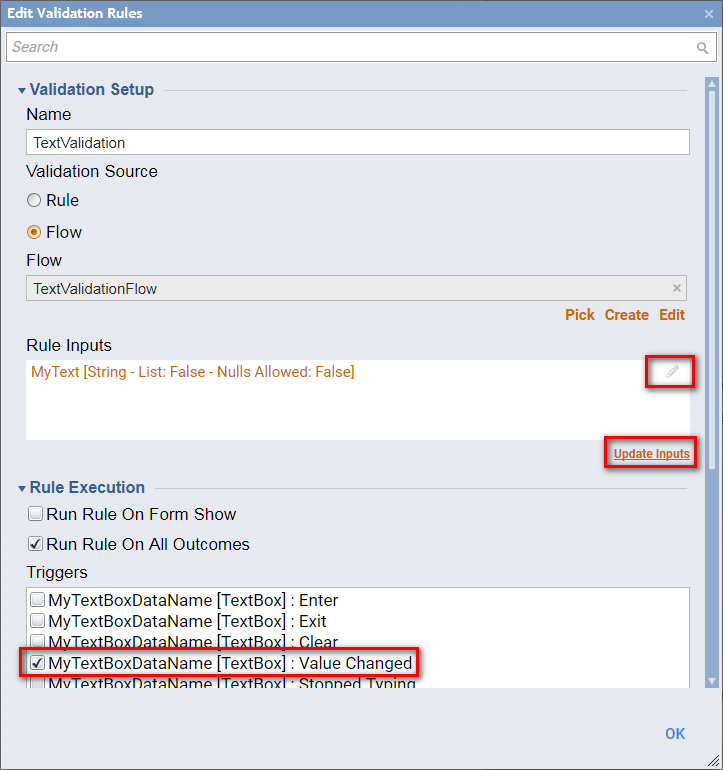 In Add Validation Rules	window we Name	our rule. 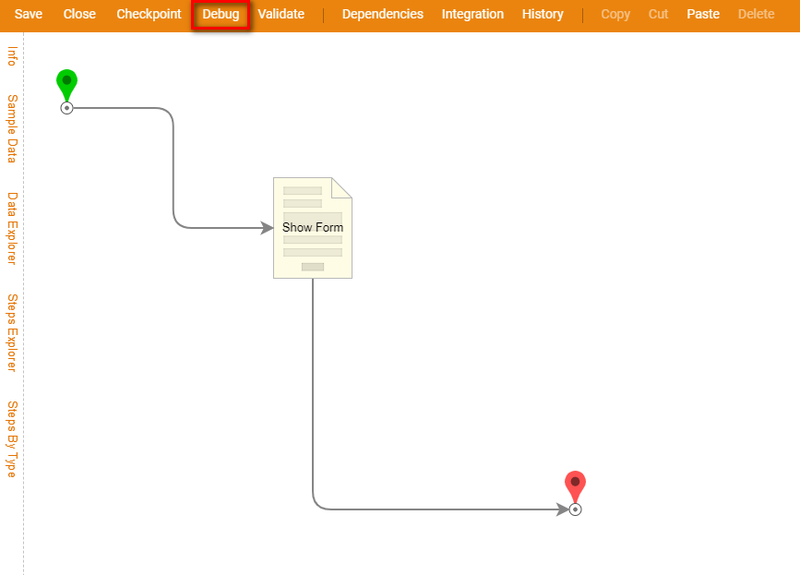 Then, we pick Flow	as Validation Source	and click Create	to build our validation Flow . In this Flow we can build any logic to evaluate our validation. First, we need to add a Flow Input	data. We are going to evaluate this data and decide if validation issue should be returned. 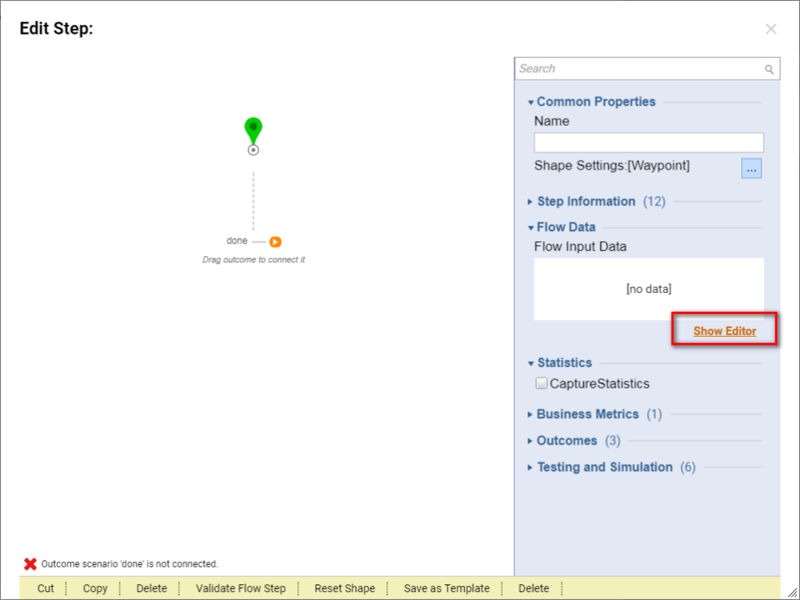 We select Start Step	in our Flow and under Flow Input Data	settings we click Show Editor. 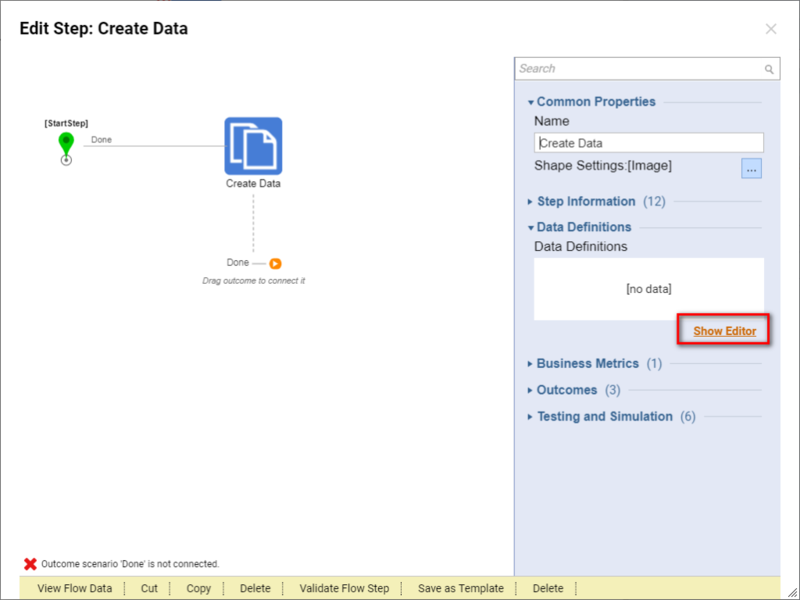 In the Data Definitions	window we create a String	and close the window to save and continue. 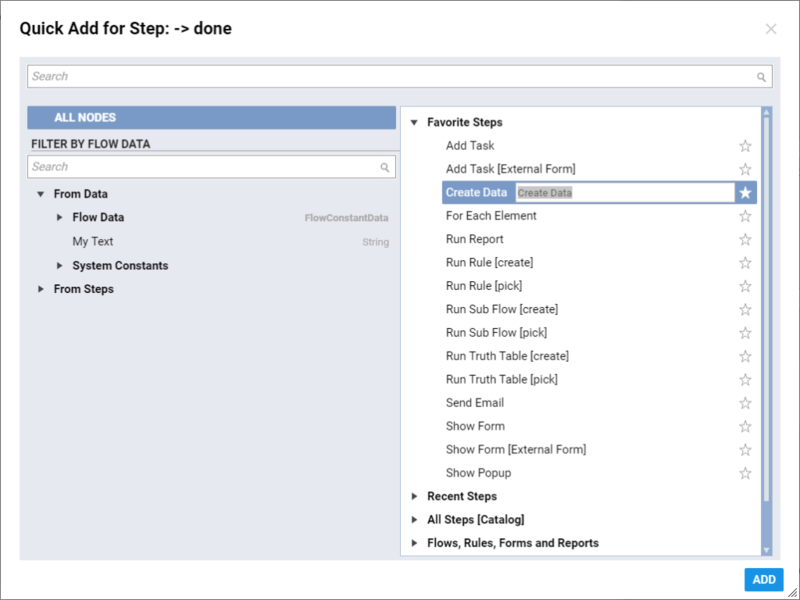 Then, we add Create Data	step from Favorite Steps	category. 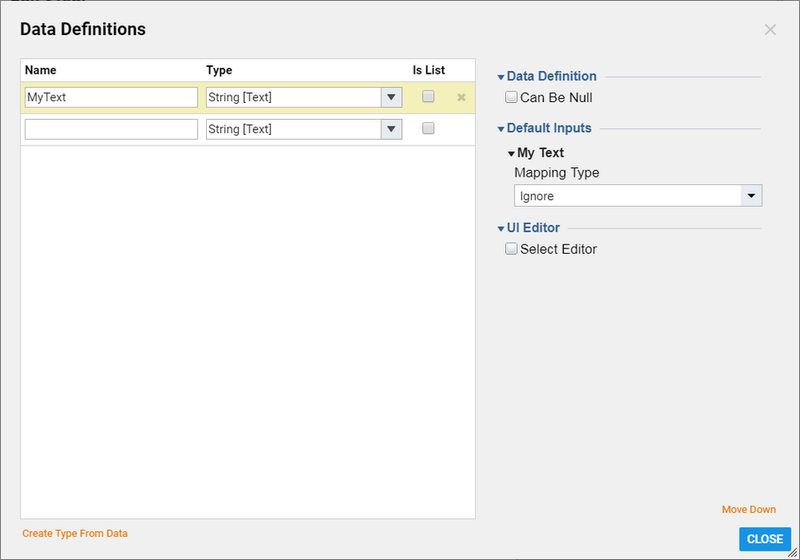 Under Data Definitions	settings for Create Data	step we click Show Editor. Here we are going to define Form Validation Issue	data to use as an outcome from our Flow . We Name	our variable and locate FormValidationIssue Type	. By default we set Null	value for this variable. 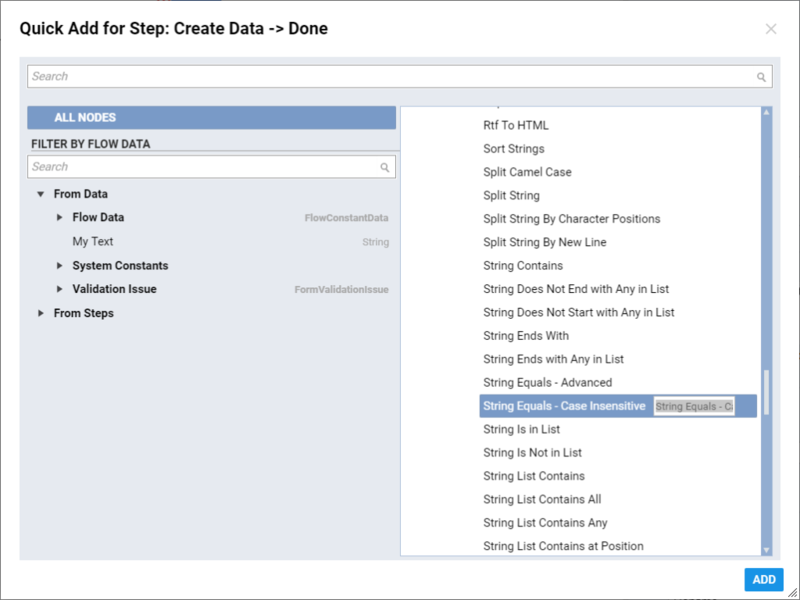 Back in the Flow Designer we add String Equals – Case Insensitive	step from All Steps [Catalog] > Data > Text	category. This is a Rule that has two input values to compare. We locate Inputs	settings and define value1	Constant ‘brake’	. 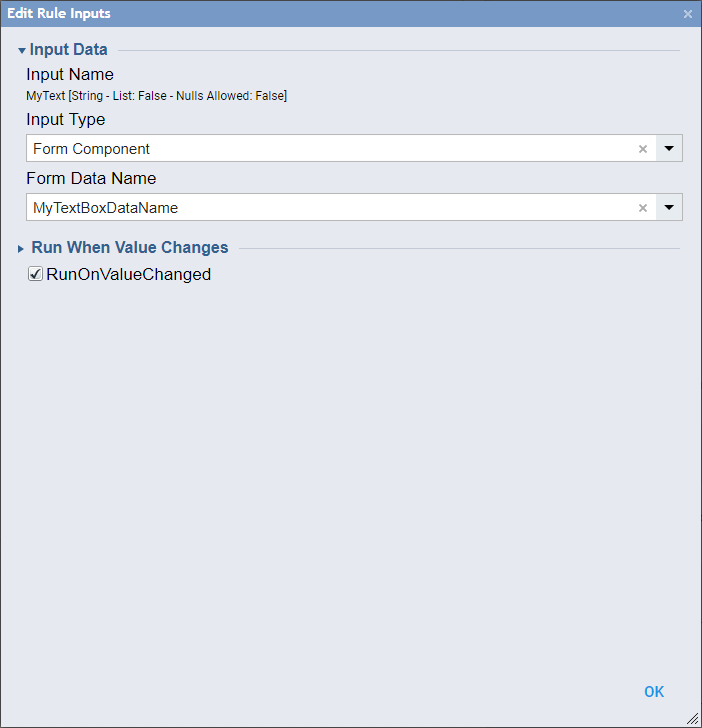 For value2	we Select Value of our Flow Input (My Text)	. 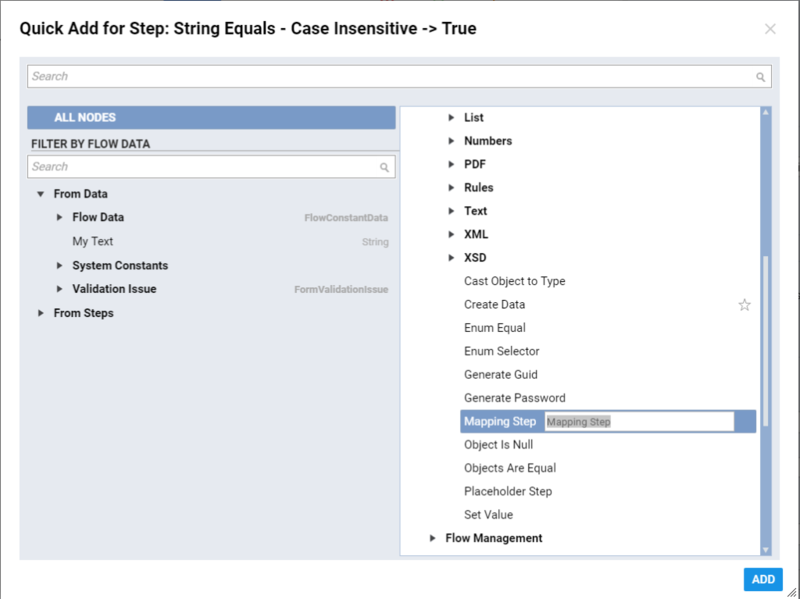 Then, on True	outcome from String Equals – Case Insensitive	step we add Mapping Step	from All Steps [Catalog] > Data	category. To learn more on how to use Mapping Step, please click here . With this step we are going to build our Validation Issue	because we know that if our Flow executes down this path then our validation should be broken. 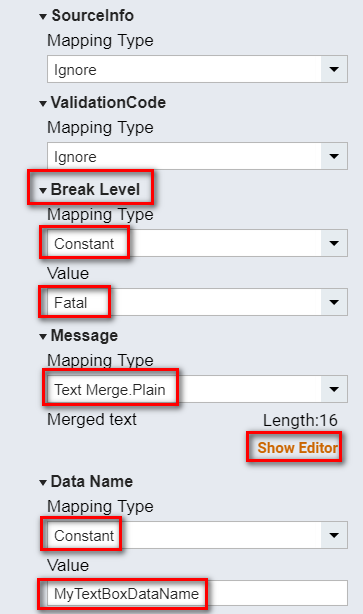 In the Mapping Step	settings we locateValidation Issue	and useBuild Data	Mapping Type. We are interesting to Build few properties: Break Level, Message,	andData Name. We pick Constant Break Level. It can be either Fatal or Warning . Then, we create a Constant Data Name	. This should match a Name	of the control on the Form where we want to display validation. In this case this is a name of our Text Box. In the Text Merge Editor	we use our Flow Input (My Text) to create a Validation Message	. When finished we can click Ok	to save and continue. 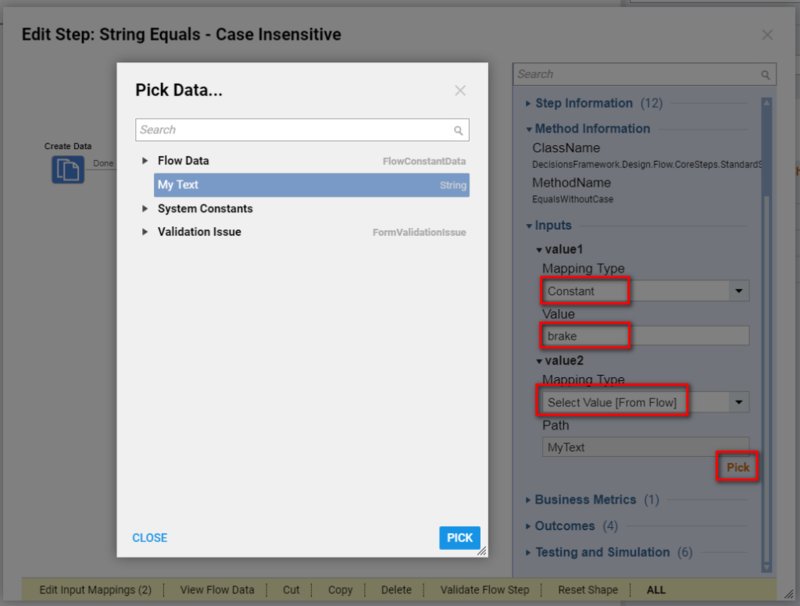 Then, we connect the outcome from Mapping Step	and False	outcome from String Equals – Case Insensitive	step to the End Step	. 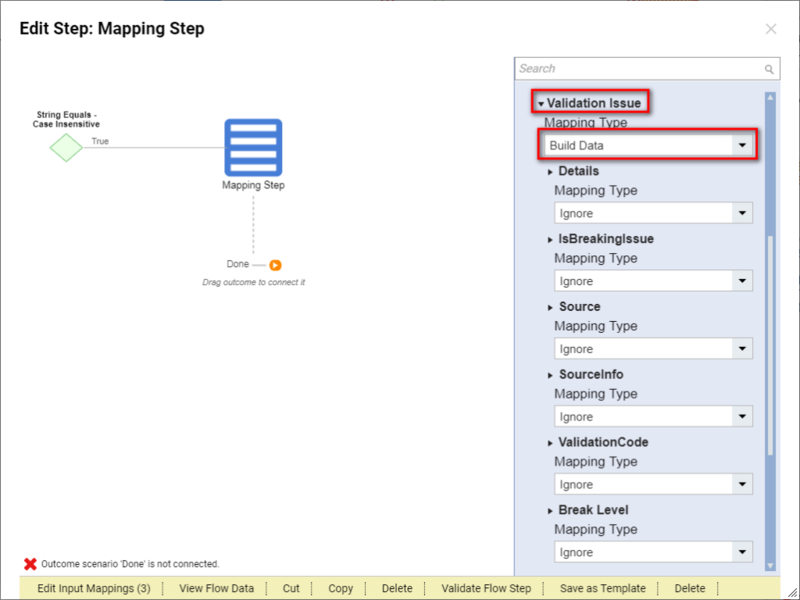 For the End Step	we need to map Form Validations	output data. 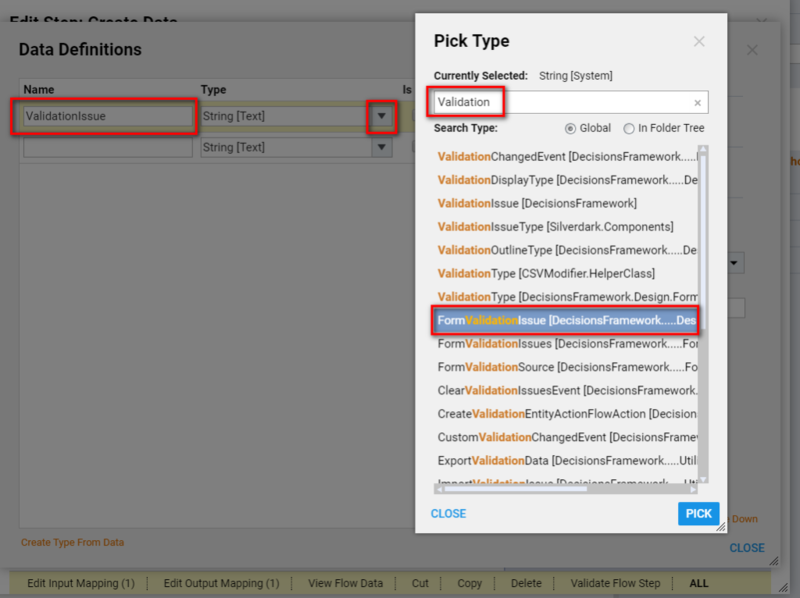 In the End Step Settings we locateForm Validations	Input and use Build Data	Mapping Type . Then, for Validation Issues	property we are going to Build Array	. 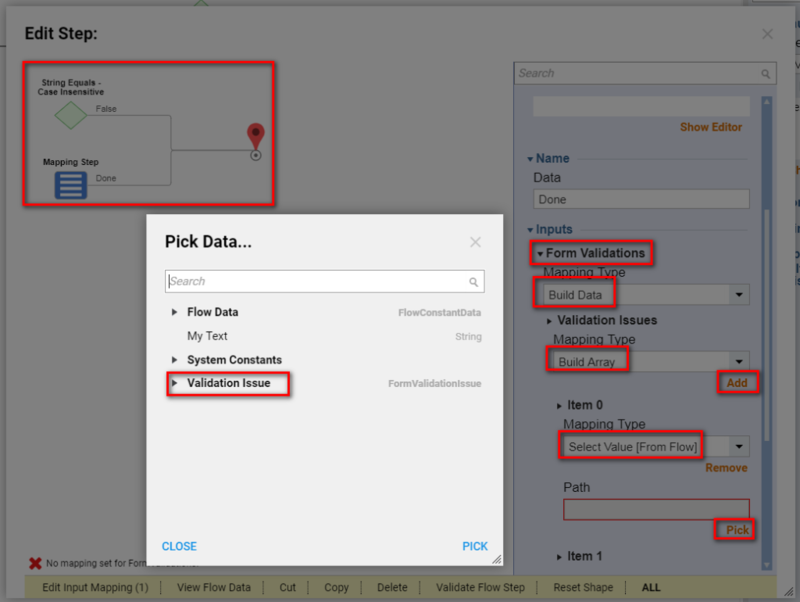 For Item 0	in the array we Select Value	of Validation Issue	that we created in our Flow	. 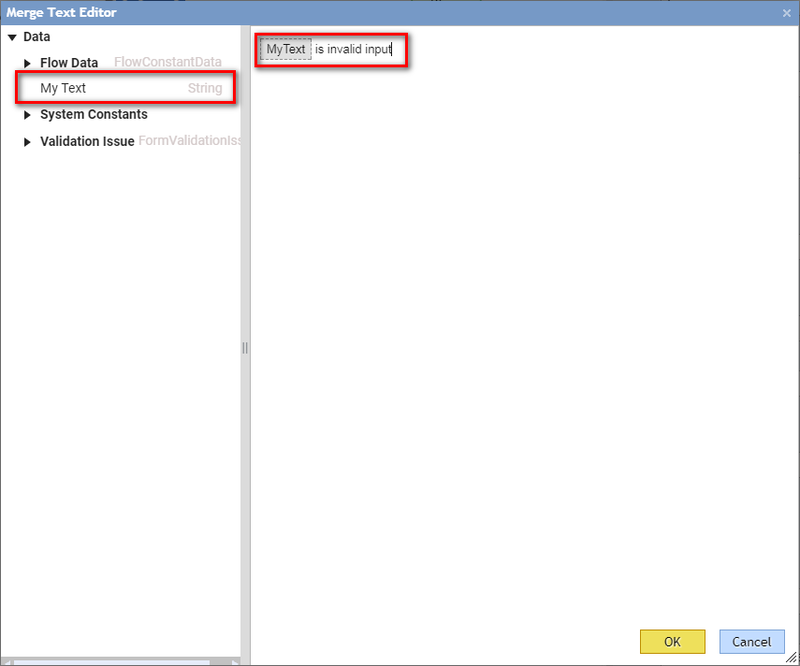 Back in the Edit Validation Rules window we define our Triggers	and Edit	‘My Text’ Flow input. 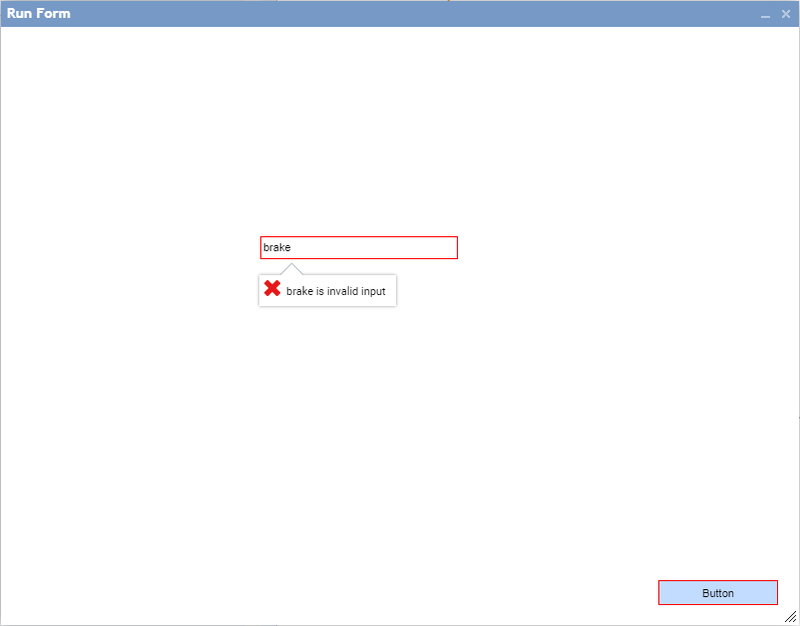 For ‘My Text’	input we use data from our Text Box Form component . This completes our Form Design . We save the Form and close Form Designer . In the Main Flow we connect Form outcome path to the End Step	. On the top panel of the Flow Designer we click Debug Flow	to test our Flow	. If we type ‘brake’ in ourText Box	, we should be able to see our validation message. If we try to Submit our Form we will see Validation issue on the Button . If the input is valid, we can successfully submit the Form .